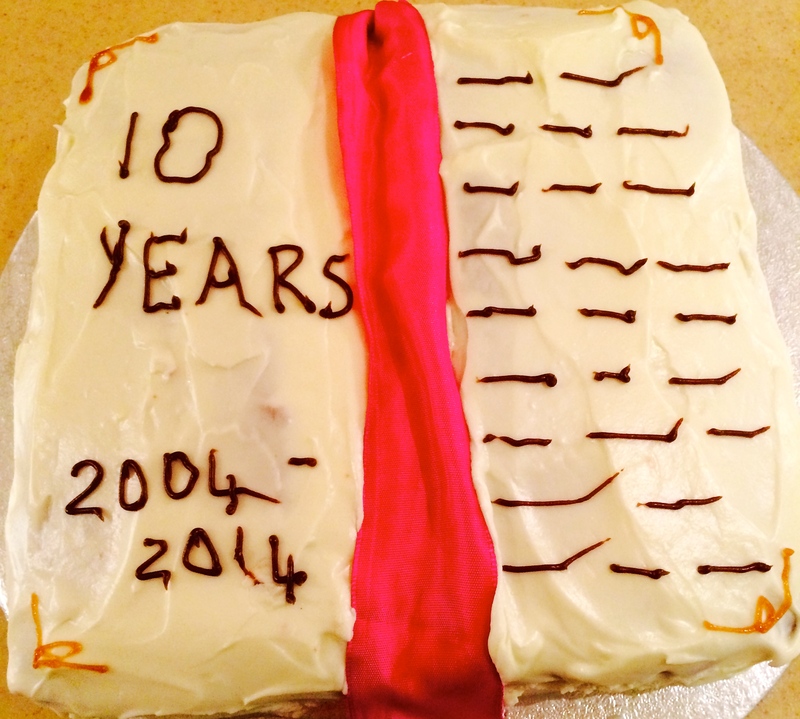 Astonishingly it has been a decade since we convened our book group – it all started back when our girls were at nursery school together and we remembered that we could read grown-up books, with chapters and without pictures if we wanted to. The gorgeous girls are dispersed amongst a number of local secondary schools now, but the five of us are still together, still reading books we might not have encountered without the suggestions of the group, still drinking copious amounts of wine and still laughing a lot. It was my turn to host, but I decided to share the load and everyone bought a contribution. 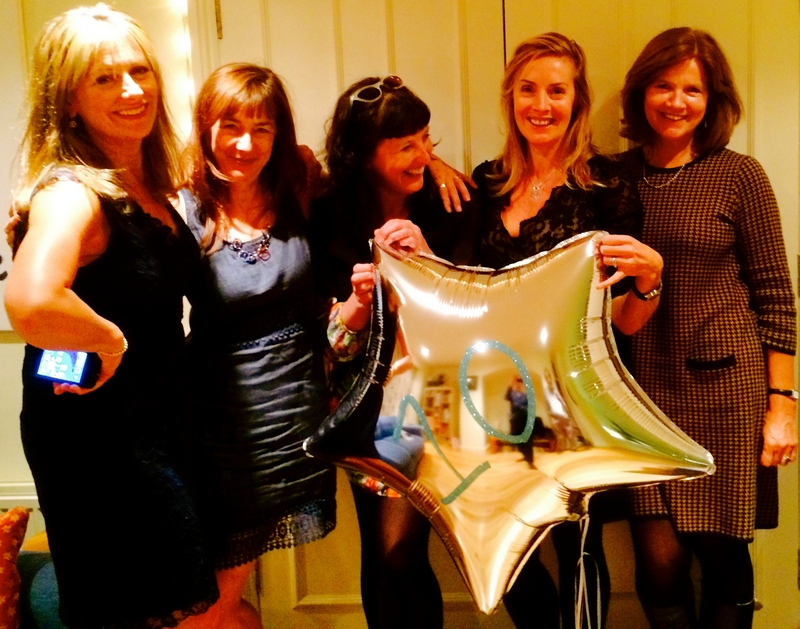 Becky was chief stylist, bringing some SuperStyling glamour to the evening, with lots of silver balloons and general glitter & sparkle. Jenny was wearing her Silver Screen Suppers hat and was in charge of nibbles. 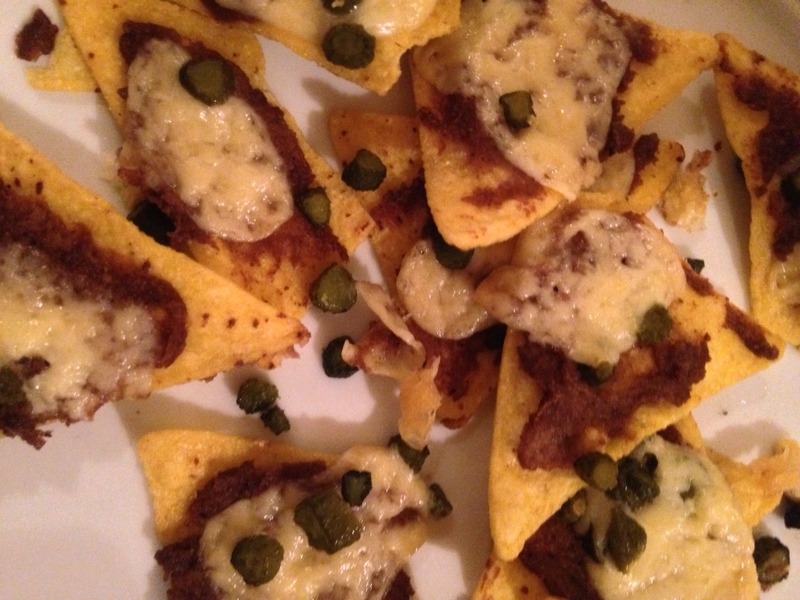 She made us some Joan Crawford Danti-Chips – “a fancy salty snack involving tortillas, potted meat, cheese and gherkins. Yum yum”. Missy B and her chum Lily were roped in to help chop gherkins and grate cheese. They did a great job and the Danti-Chips, slightly odd though they sounded, were very tasty. I preferred the beef flavour, although chicken was popular too. Lindsey made a lovely oriental-ish bruschetta – really delicious. I failed to get a pic of those, but I have asked for the recipe and will post that. 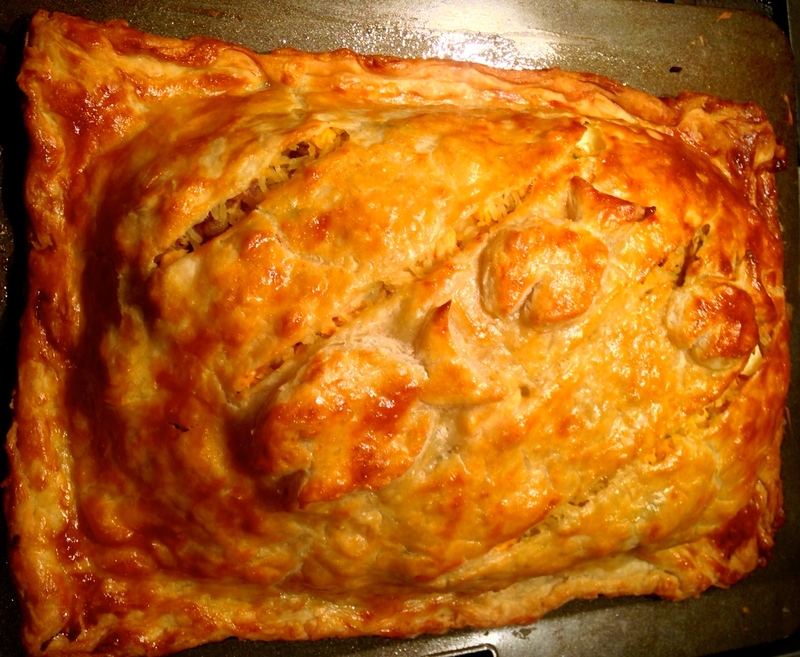 For the main course I made this salmon coulibiac, with an improvised fish-free version for our vegetarian guest. Pam, who was staying the night, before kindly made the little fish decorations for me and also a rather outlandishly large carrot for the veggie version (I put some parsnips in this and some stir-fried cabbage with garlic – cherry picking the bits I liked the sound of from a couple of recipes I unearthed on the internet). This Russian dish is a bit of a carb-fest but it seemed to go down well. As I prepared the pie, I remembered that Becky doesn’t like eggs and Jenny is not fond of mushrooms, but they both seemed to take my faux pas in their strides. Had to pop over the road to my neighbour to borrow the food processor to make some hollandaise sauce (it’s ridiculous that I don’t have one and I didn’t fancy risking making it by hand for this many people). 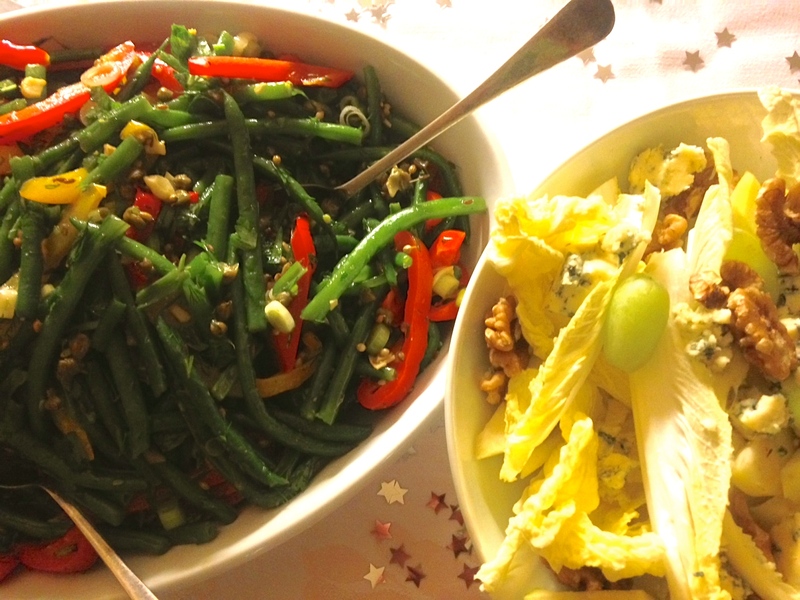 Mary brought two Ottolenghi salads, one green bean-based, the other with warm and spicy chickpeas. Becky also brought a blue cheese, walnut and pear salad. All great accompaniments and enough for everyone to go home with some leftovers for their lunch on Saturday! We read Love, Nina by Nina Stibbe, which the ladies all found very entertaining. The guests who read it were rather underwhelmed. We also read Untold Stories by Alan Bennett (there is a connection between the books) – I know he’s a National Treasure and everything, but I found the diaries dull and (unusually for me) didn’t finish this one. I don’t think we did anything to dispel our reputation as the “bring a book drinking group”, but I’m pretty sure everyone had a good time.